Want to know where those MB are going? Data Breakdown on My Optus app lets you see at glance which sites and apps use your mobile plan's data the most. Discover your biggest hubs of online activity and how much data you're using where on a daily basis. You can view and compare your internet activity over the last 30 days in Data Breakdown. Data Breakdown shows you all the data use that's happening via the SIM card in your device, including Mobile TV and music streaming that may not use the data in your plan. You can opt out of Data Breakdown anytime you like and add it again in settings. Why should I look at my Data Breakdown? If you are concerned about which websites or apps use up your data, Data Breakdown helps you review your data usage over a period of time. A category shown in your Data Breakdown usage is usually a single website or app (e.g. Facebook). In some cases websites are grouped into an umbrella category to make it easier to understand your usage. For example, many obscure websites will fall under a category of "Browsing". Why isn't the website I go to every day appearing in my top 5? Sometimes the websites you visit use other websites to provide content. For example, if you view a video on a particular site, you may be accessing the video via YouTube or another streaming site. If you opt-in to viewing data insights, we may send you recommendations for internal products that are based around those insights. You can opt-out of receiving those recommendations in the settings sections of My Optus App by toggling the Smart Recommendations setting. Can I also see Data Breakdown for my Home Broadband service? 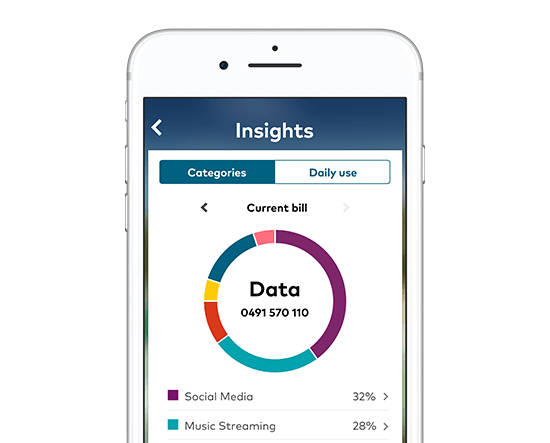 Data Breakdown usage is only available for your data usage on the Optus mobile network. Why do you only show my top 5 visited websites or apps? Analysis has shown that five categories generally cover most of the data consumed within a month. Will data free streaming show up in Data Breakdown? Although data free Mobile TV and music streaming doesn't use your plan's data, this usage will show up in your Data Breakdown. This is because Data Breakdown is a representation of all the data you have consumed within a period of time, including data free streaming. If you're a new customer there will be no data usage for previous months. For Postpaid customers, you may have just entered a new billing cycle and have not consumed any data within the current period. Can the account holder see Data Breakdown for every service in the Data Pool? No. You can only view Data Breakdown for your SIM card. Data Breakdown for shared services are not accessible by the account holder. How long can I access my Data Breakdown for? For postpaid customers, the current and previous two billing periods can be accessed. Prepaid customers are able to view the previous 60 days' worth of data. Your data is safe as we will only collect and use data in accordance with the Privacy Act. We've included a PIN Lock functionality within the My Optus App for added security. If you decide to opt out of Data Breakdown, the Data Breakdown button will no longer appear on the App.